The UN Security Council has called on Kenya's political leaders to solve the crisis there through "dialogue, negotiation and compromise". In its first official response to the unrest sparked by December's disputed election, the council expressed concern at the "dire humanitarian situation". 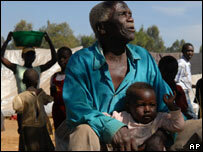 Nearly 1,000 Kenyans have been killed in the violence and 300,000 displaced. Opposition leader Raila Odinga has accused President Mwai Kibaki of rigging the presidential election. Foreign ministers from Djibouti, Ethiopia, Sudan, Uganda and Somalia have arrived in Nairobi for a meeting of the East African regional group, Igad, on Thursday to discuss the crisis. The Security Council statement gave strong backing to efforts by the former UN Secretary General, Kofi Annan, to find a solution. "The council emphasises that the only solution to the crisis lies through dialogue, negotiation and compromise and strongly urges Kenya's political leaders to foster reconciliation," it said. The council called on Mr Odinga and Mr Kibaki to meet "their responsibility to engage fully in finding a sustainable political solution and taking action to immediately end violence". Gangs must be disarmed, human rights restored and the humanitarian situation improved, it said. "Recalling the need to avoid impunity, the council calls for those responsible for violence to be brought to justice," the statement added. A UN fact-finding mission arrived in Kenya on Wednesday to collate information on suspected human rights abuses. The UN High Commissioner for Human Rights, Louise Arbour, said: "Truth and accountability are of critical importance in putting an end to the violence and preventing future human rights violations." The meeting of the Igad group has sparked anger among Kenya's opposition, which has warned it will hold mass rallies if it goes ahead. Mr Odinga's Orange Democratic Movement (ODM) said it was not consulted about the gathering, which could undermine talks being chaired by Mr Annan. ODM Secretary General Anyang Nyong'o said: "If the meeting goes ahead as planned we shall mobilise our supporters for a peaceful demonstration against President Kibaki's government." 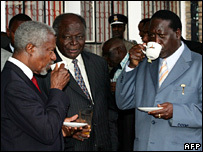 But Mr Annan sought to ally the ODM's fears, saying Igad had nothing to do with his negotiations. "All parties must avoid provocative statements touching on the matters in discussion," he said. A framework for the negotiations was agreed last Friday, including what caused the political crisis and issues relating to land distribution and historical injustices. Meanwhile, heads of the country's tourism industry have gathered in Nairobi to devise a strategy to minimise the damage to their businesses. Revenue has been cut by an estimated $80m (£40m). But what price have Kenyans paid?